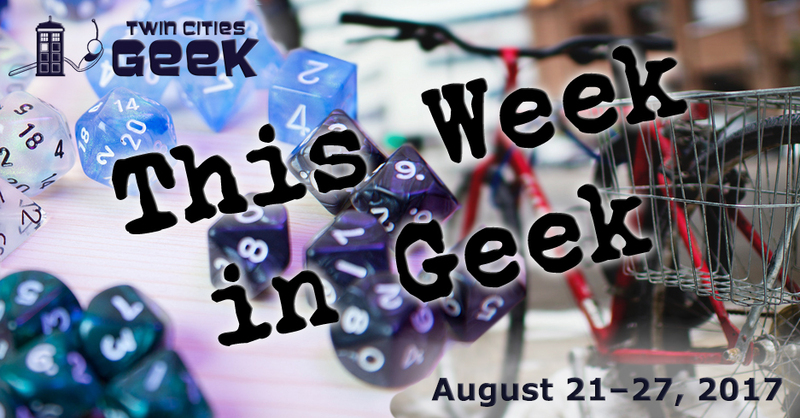 Welcome to This Week in Geek, your guide to events of interest to the Minnesota geek community for the week of Monday, August 21st through Sunday, August 27th. When: Monday, August 21st at 11:00 a.m.
Monday brings a solar eclipse, and the Science Museum can help to appreciate and understand what we’ll witness here (the total solar eclipse will be visible in other parts of the US, but not here). Enjoy eclipse-themed projects and activities and then gather on the 3rd floor terrace at 1:07 p.m. to view the 80 percent eclipse that we’ll be able to see in Minnesota (weather permitting), with free eclipse glasses. This event is included with normal museum admission. For more information click here for our article on when, where, and how to view the eclipse in Minnesota! When: Monday, August 21st at 6:30 p.m. When: Tuesday, August 22nd at 4:00 p.m. When: Tuesday, August 22nd at 6:00 p.m. Experience a night with master musician Suzuki Kyosuke and take in five pieces of music that are played at festivals and are typically associated with Shinto shrines. The evening will begin with an open lecture and demonstration from a master musician and dancer of the Wakayama Performance Troupe. The event is free and open to the public, but a $10 donation is recommended. Following the lecture and performance (and the following evening—see event details) there will be master classes offered to teach the ins and outs of this complex musical form. The classes are $50 per night, or $80 for both. When: Tuesday, August 22ns at 7:00 p.m.
Come for a fun and geeky night complete with trivia, a movie screening, and punnery with host Rob Callahan. Trivia starts at 7:00 p.m. and the movie begins at 9:00 p.m. This is a free event with prizes available including a $50 bar tab, board games, and books. Clubhouse Jäger’s happy hour extends until 10:00 p.m. on Tuesdays, meaning $4 taps and rails. When: Tuesday, August 22nd at 6:30 p.m. Hear some catchy tunes and learn how to dance while experiencing the tapestry of Twin Cities culture at 9 Nights of Music. This weekly event begins with dance instruction before leading to musical performances. This week, join Orkestar Bez Ime for some Balkans party music. When: Tuesday, August 22nd at 7:00 p.m.
Come and experience YogaQuest, a blend of yoga and fanfiction storytelling led by certified yoga instructors. Experience a yoga workout experience and a story at the same time. This week’s theme the classic Star Trek episode “Mirror, Mirror,” so get yourself a goatee or wild-looking clothes. When: Wednesday, August 23rd at 6:30 p.m. Taste Culhane Brewing’s beers and help fund their renovation project with this party. Enjoy live music and help a worthy cause in order to keep artistically brewed beer in Lowertown. The Speculations Readings Series continues at Dreamhaven Books, and each event includes a reading, a reception and a post-reception expedition to a nearby bistro. This month’s guest of honor is local writer, Twin CIties Geek contributor, and Geek Date Night host Rob Callahan. Rob has a new novel out, The Devil’s Descent, and is currently working on a sequel, A World Within the Walls. New Native Theater at the Gremlin presents the second annual National Native American Ten Minute Play Festival on starting on Tuesday night. This event acts as a showcase to premiere new plays by local and national playwrights who are emerging or in the middle of their careers. The Saturday show will be followed by a concert to celebrate with Annie Humphrey and Cole Premo. When: Wednesday, August 23rd at 7:00 p.m.
Join your fellow Whovians and trivia fanatics at the Driftwood Char Bar on Wednesday night for Minnesota’s only regular Doctor Who trivia night, brought to you by the creators of TC Trek Trivia. This is an all-ages event with no cover, so expect seats to go quickly. When: Wednesday, August 23rd at 8:00 p.m. In the weekly New Comic Book Day series, see the debut of interesting new comic books and hear sets from local comedians while enjoying delicious beer. Elliot Rahal and Grace Thomas act as hosts. This is your opportunity to join the live studio audience for Minnesota Tonight, the show that keeps you up to date on your state! Minnesota Tonight takes on Minnesota politics and news through a satirical lens which will be familiar to fans of The Daily Show. Enjoy musical guest Trevor DeVine and a fully stocked bar in case the political satire gets a little too real. The show is 18-plus, and tickets are $10 in advance or $12 at the door. Click here for Twin Cities Geek‘s review of the show. When: Thursday, August 24th at 10:30 a.m.
Why would a major metropolitan area sprout so far north? This event at Mill City Museum attempts to delve into that question by teaching the history of hydropower and how it pertains to Hennepin Island. Learn about early 20th-century mills and hydroelectric power that turned Minneapolis into Mill City, an economic powerhouse for this part of the prairie. Guests must sign a waiver to participate and will be expected to walk a mile and a half over uneven terrain. Cost is $14 for museum members or $18 for nonmembers. When: Thursday, August 24th at 6:30 p.m. When: Thursday, August 24th at 7:00 p.m. When: Thursday August 24th at 7:30 p.m. This monthly comedy series takes a team of eight talented local improv comics for an evening of comedy based on the suggestions of folks in the r/WhatTheImprov subreddit. If you’re a fan of comedy spurred on by the strange things people say with Internet anonymity, this could be the night for you. Tickets are $5 at the door. Click here for our review of the series debut. Movies in the Parks: E.T. When: Thursday, August 24th at 9:00 p.m. The Minneapolis Park and Recreation Board is presenting movies in various parks throughout the city over the course of the summer, and one showing this week is E.T., the classic story of a childhood connecting with an alien with a child’s innocent sense of wonder, love, and openness to the unknown. See the full schedule for all Minneapolis Movies in the Parks here. When: Friday, August 25th at 10:00 a.m. to Sunday, August 27th at 5:00 p.m.
Furry Migration is an annual convention for furries held in Minneapolis. This year’s theme is Heroes Divided, focusing on heroes going into hiding after the passage of the COLLAR act. The convention has a variety of events for furry enthusiasts, including dances, an ice-cream social, video gaming, room parties, panels, and more. Registration is $55; see the website for programming details. Lakehead Harvest Show is an opportunity to celebrate the waning days of summer and the coming harvest with fun for the whole family and tons of stuff for motorcycle and agriculture geeks. Take part in a variety of activities, including tractor pulls, potato digging, a classic motorcycle expo, blacksmithing, threshing, and more. The show is $13 for the whole weekend, $7 for day passes, and free for children under the age of 11. When: Friday, August 25th at 6:00 p.m. When: Friday, August 25th at 8:30 p.m. When: Saturday, August 26th at 8:30 a.m. Put your yoga experience to use and level up to dive deeper into familiar poses, and even learn new feats (poses). There is a $15 charge for this advanced class. When: Saturday, August 26th and Sunday, August 27th from 9:00 a.m to 7:00 p.m.
Saturday Morning Cartoons: Invader Zim! When: Saturday, August 26th at 10:00 a.m.
Another event held at the YogaQuest YQdio this week is Saturday Morning Cartoons, which features “classic (and not-so-classic) Saturday morning cartoons, plus yoga, plus the stupidest cereals in existence!” The yoga practice will consist of “some gentle wake-me-up vinyasa followed by a session of stretchy, restorative yoga, all set to cartoons, and wrapped up with a bowl of delicious technicolor goodness.” This week’s theme will be Invader Zim! When: Saturday, August 26th at 12:00 p.m.
Geeky Lil’ Car Show is Grumpy’s free exhibition of pop-culture vehicles from TV, movies, and more. This is the second year of show, which is free and kid friendly. When: Saturday, August 26th at 7:00 p.m. The Friends of the Cemetery present the first in their fall Vincent Price cemetery screening series, The Last Man on Earth. Gates open at 7:00, the film will begin at dusk (roughly 8:15 p.m.), and tickets are $10. Refreshments will be on sale at the cemetery; coolers, alcohol, pets, and recording are prohibited. When: Saturday, August 26th at 9:00 p.m.
Red Bull Sound Select is a monthly evening of music curated by local taste makers. This month in Minneapolis, the event is curated by Totally Gross National Product and includes the Scientist, Hempress Sativa, Peaking Lights, and Psymun. This evening is 21-plus, and admission is $5 with RSVP or $15 without. When: Saturday, August 26th at 11:59 p.m.
At 11:55 p.m. on the last Saturday of every month, the Uptown Theatre screens The Rocky Horror Picture Show, the “longest running midnight movie of all time.” Transvestite Soup is the Twin Cities’ shadow cast for the showings, performing for your pleasure as part of the cult classic’s well-established tradition. When: Sunday, August 27th at 12:00 p.m. Gender Jam is a safe social meetup for trans, gender-nonconforming, intersex, and questioning youth for video games, board games, snacks, and togetherness. It’s normally hosted at the Exchange Minneapolis, but this week’s event will be at East Lake Nokomis to take part in the Mondo Queer Beach Party, an intergenerational LGBTQ beach meetup. This is a great opportunity for the youth of Gender Jam to connect with the larger community and have fun in the sun.